Wow, what a fabulous full day I had in Moscow! I'll be honest and say I'm now looking forward to tomorrow more than ever. 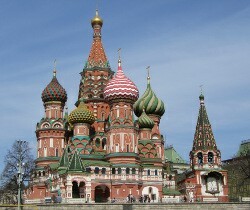 I think Moscow is very cool! I slept well, woke up at 8am and went down for an average breakfast. I met up with my guide, Tatyana, at 10am. Okay, so here is about when I realise that this is not a tour group like I'm used to travelling with. It is literally me, on my own. I don't know if just no one else booked or this is just the way they do tours (as in you would book for a group thru them instead of them making up a group, like Intrepid does it). Anyway, will leave the worry about being completely alone on the train for another time! We skipped the Memorial Museum of Cosmonautics because it is closed on Mondays and I'd already wandered the rest myself yesterday. So we went straight to these Pavillions. I'm not sure I really understand them, but I think they were basically constructed to provide market places. Anyway, they were nice enough to wander thru. 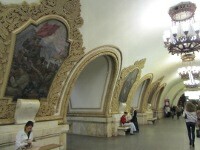 After that we hopped on the Metro at VDNKh and she showed me how the tickets work etc. 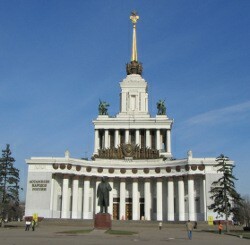 First we travelled to Prospect Mira where we got out, then to Komsomolskaya and then to Novoslobodskaya. 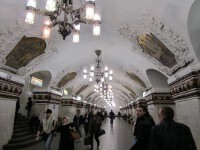 This was all to see some of their gorgeously decorated Metro Stations. 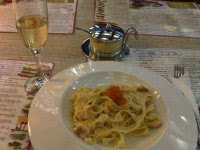 It was quite amazing! It is awesome that you can travel as much as you like, changing lines, on one trip cost until you go back up to the ground level. And it's only 28RUB per trip. 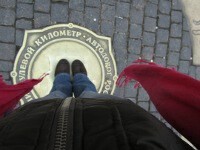 After that we headed to Smolenskaya and came up to walk along Arbat Street (a pedestrians only street). Was so peaceful, just a normal working day here in Moscow (back home it's a public holiday!). 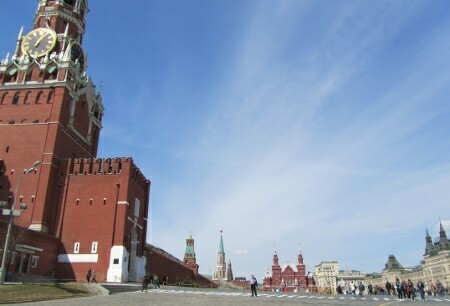 From there we arrived at The Kremlin. We didn't go inside. I'm not sure I'm that interested to but, I might tomorrow depending on time because apparently there is a Faberge Egg Exhibition on. Other than that, I'm just not sure it's worth the long queues to get inside. We walked around to the State History Museum building and stood on Kilometre Zero (apparently all distances in Moscow are measured from there). There is obviously some tradition of standing and throwing a coin behind you while standing on it but, what I thought was most peculiar was that there was an old Russian lady collecting the thrown coins up right as they landed. She wasn't even being subtle! But first, lunch as part of my traditional foreign MacDonalds experience. I had the Chicken & Bacon burger. The queues were insane (I was hoping that at 13h30 I'd have missed the lunchtime rush but no, it was chaos!). It was not noteworthy. The State History Museum was pretty cool. Russia clearly has a very well documented history. I'll be honest and say they lost me a few military-uniform-rooms in. But I was fascinated by their old books on display. Apparently the Russian State Library (which we'd walked past on our way from Arbat Street to The Kremlin) is the 2nd biggest library in the world (third according to wikipedia). 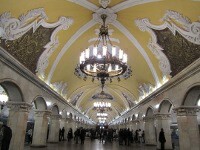 After that I headed back to the hotel to collect my train ticket for tomorrow from a courier.